This summer saw the return of SILICON DREAMS, the electronic music festival whose roots were founded in the Vintage Computer Festival back in 2010 (an event which also featured OMD performing live). 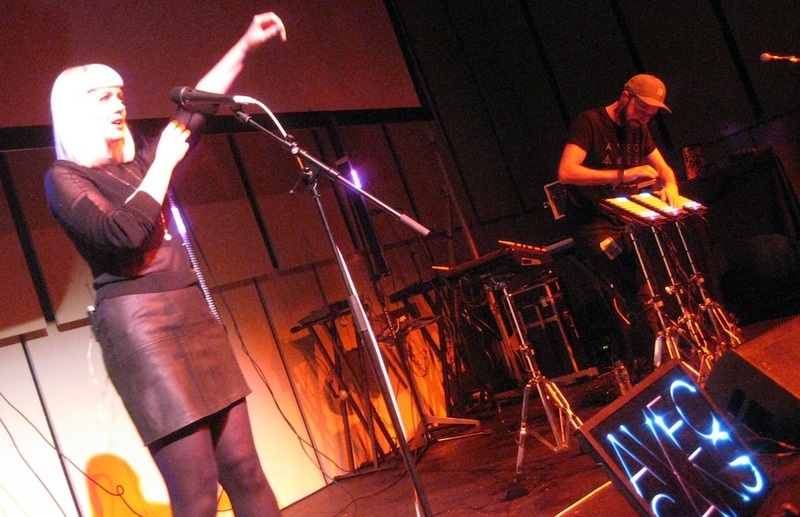 The festival returned in 2013 with both Heaven 17 and Northern Kind in performance, an event which TEC writer Jer White summed up as “synthpop’s still alive and as vibrant as ever”. Once again curated by Silicon Dreams’ founder Simon Hewitt, the 2017 event ambitiously took on the task of staging 6 acts who pull from both established artists as well as performers who are just embarking into the world of electronic music. The venue of choice for this year’s event also stepped up a gear with the Liverpool’s Philharmonic Hall Music Room setting the stage for the return of Silicon Dreams. Caroline McLavy kicked off proceedings with tracks culled from her impressive debut album Electrostatic, giving the event a slick start. As discussed in TEC’s review of the album, McLavy’s material is “…peppered with synth hooks, emotive melodies and simply good danceable rhythms”. The likes of ‘You Know’ are given much more of an impact on stage, courtesy of McLavy’s confident stage presence and equally strong vocals. Elsewhere, the bassy tones of ‘I’ll Take My Chances’ and bangers such as ‘Miss Perfect’ and ‘Constant Pain’ show a solid collection of songs in her arsenal. Meanwhile, the tropical rhythms of ‘Where Did I Go Wrong’ take things down a gear. Finishing things up is the deceptively slow intro to ‘Calm Before The Storm’, which erupts into a percussive belter at the halfway point, ending McLavy’s set on a high note. In The Electricity Club’s interview with Caroline McLavy earlier in the year, she summed up the advantages of taking her songs to the stage: “Often electronic music has a human disconnect by its nature that playing live can put back into the music. It puts blood into the veins of the songs”. The next act to grace the stage is Voi Vang, a younger artist just establishing herself on the electronic music scene. Initial mic problems aside, she promises a setlist of songs both old and new (including one she’d apparently first conceived when she was just 7!). On stage, Voi Vang combines tunes that draw equally from both pop and EDM influences, married with an effective choreography. ‘Sleepless Night’ is given a much more punchy dynamic on stage, plus there’s hints of New Order in the insistent Blue Monday-esque beat. Meanwhile, new track ‘Lipstick’ throws a nod to EDM combined with a more robust electronic base. VV gives a more languid vocal delivery on this one, while still busting moves like there’s no tomorrow. Keen to add more of a theatrical element to her performance Voi appears to erupt with blood at once point, which scares the bejesus out of the audience stage-front. But it’s fake blood to the relief of all. No performers were hurt during the making of this music festival (John Van Ahlen gets stabbed in the back during the Parralox set, but that’s for later…). ‘Mirror’ starts out with a plaintive piano melody before transforming into a much more dynamic dancepop number. Here, Voi Vang demonstrates her range, hitting some impressive notes while equally keeping up the pace with her dance moves. There’s more of a darkpop appeal to ‘Cards’ (a song she introduces by suggesting to the audience “please feel free to dance anytime”). She concludes the set with a brand new track, culled from a debut EP which is still in the works. ‘Specks Of Gold’ has a trance-dancey beat to it and it’s a strong number to finish proceedings on. The glue that often holds multi-band events likes this together is the DJs, which can often be a bit of a lucky dip. Playing obscure tunes might rack up your expert points, but it’s pretty useless if you can’t connect with an audience. Luckily, Silicon Dreams had DJs from both AnalogueTrash and Pink Parrot on hand who managed to combine classics with some of the best of contemporary electronic music. This including tracks by Susanne Sundfør, Air, Trust, Grimes, a fine mix version of Heaven 17’s ‘(We Don’t Need This) Fascist Groove Thang’. Also in the mix are a few wonderful surprises, such as Scarlet Fantastic’s ‘No Memory’. Back on stage, the arrival of Berlyn Trilogy presents a change of gear with the retro-futurist’s selection of brooding darkpop delights. The trio manage to evoke the style of classic synthpop, but without falling into pastiche, which is often a difficult position for many contemporary electropop acts to arrive at. Tracks such as ‘Wreckage Of Love’ have a gothic sensibility, while ‘Synthetic Love’ offers up percussive pop. Meanwhile, ‘The Drone’ combines burbling electronics and sharply defined synth notes alongside some darkly intoned lyrics from Simon Rowe: “The house will burn to the ground/As I watch the sparks fly”. Also weaved into the mix is some choral effects which lends the whole affair a widescreen quality. 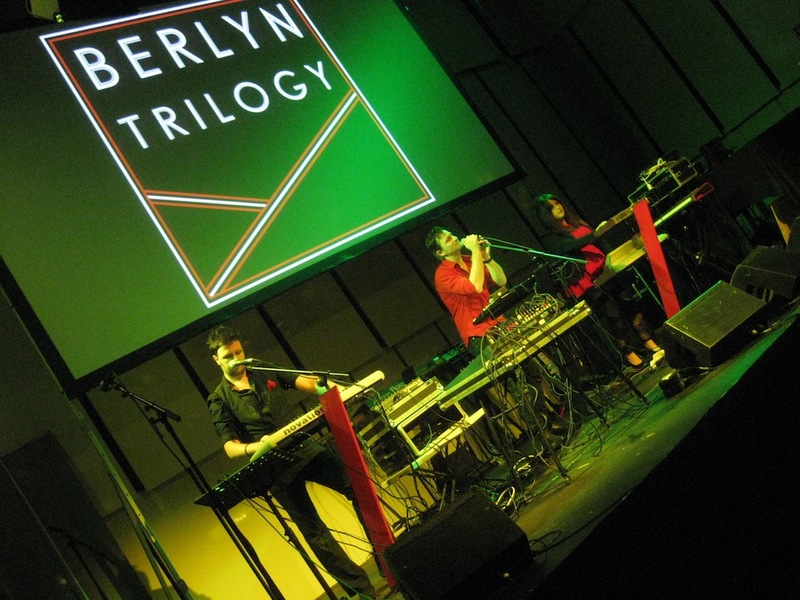 Berlyn Trilogy also delivered some new songs, played here for the first time, which included the melancholic ‘Rain’. While the band present their own particular flavour of darkpop, there’s also a chemistry on stage that often emerges in witty banter. Plus, they’re a band that are willing to utilise classic instruments when they feel it’s necessary, such as Faye Williams strapping on a bass guitar for some songs. The rolling moody tones of ‘Departed’ finishes Berlyn Trilogy’s set off, complete with a stark video backdrop. An established force on the electronic music scene since their impressive 2010 debut Dirty Little Secrets, Future Perfect’s darkpop material has been partly inspired by early OMD and the lyrical darkness of Joy Division and Depeche Mode. Although as FP’s Simon Owen commented in his recent interview with The Electricity Club, there’s also a big musical legacy based on dance and EDM at work in Future Perfect’s songwriting. Future Perfect can draw from an extensive catalogue of songs curated over three studio albums, here opting for the crunchy pop sensibility of ‘War of Words’ to start things off. The husband and wife team bounce vocals duties between each other in some very pointed lyrics: “Playing out games when the damage is done/Firing slander from a loaded gun”. ‘Hunter’ is one of Future Perfect’s best-known numbers and the live rendition demonstrates that the tune has lost none of its power over the years. Its brooding electronic melodies combine with Rebecca’s powerful vocals to deliver a darkpop dance classic. The duo also bring things up to date with the insistent beats of ‘Fall’, taken from their most recent album After The Fall. Meanwhile, ‘Victoria’ is one of Future Perfect’s newer tracks and is another fine example of the pair’s knack for crafting fine electronic dance tunes. Its frenetic rhythms find a response from an enthusiastic audience (now warming up to the idea of putting on their dancing shoes). The duo close out their set with ‘Protect And Survive’, with its use of the ‘80s public service announcements lending a curiously unsettling atmosphere to proceedings. Despite this ominous overture, it’s a tune with blistering electronic melodies and provides a powerful end to Future Perfect’s set. At times, the work ethic of some electronic outfits can be quite surprising. Take Avec Sans, whose tour schedule for 2017 takes in the UK top to bottom (they’d also driven up from a gig in Bristol the night before). Equally, there’s an energy at work here on stage as the duo of Alice Fox and Jack St James power through a set of euphoric pop numbers. Fox’s delicate vocal delivery appears to float over the densely layered electronic rhythms. Meanwhile, St James has an uncanny knack of appearing to run everything at once, racing his fingers across a trio of launchpads in tandem with electronic percussion and keyboards. The duo’s bassy cover of Bon Iver’s ‘Perth’ draws a good response from the crowd. Elsewhere, the busy melodic delights of ‘Shiver’ present a whirlwind of pulsing beats. But the duo’s ability to pull together crunchy, percussive electronics and wistful vocals is perhaps best typified in their live rendition of ‘Heartbreak Hi’, the title track from their 2016 debut album. The lyrics have a bittersweet element to them, touching on the difficulties of letting someone go: “and then through every window I saw you/mistaking strangers for you I saw you”. There’s a polished quality to the material on offer, that nonetheless retains a pop sensibility. It’s perhaps not surprising that Avec Sans get picked to perform alongside the likes of Ladyhawke, Little Boots and Pet Shop Boys. As a bonus, the pair also come across as possibly the nicest people that Team TEC has met in the electronic music world. 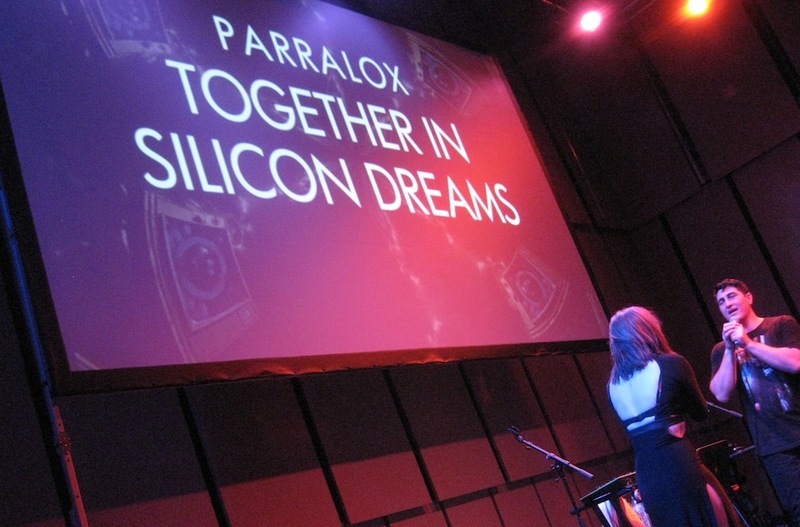 Parralox remain one of electropop’s success stories in recent years. The Australian outfit masterminded by John von Ahlen have produced a staggering output since the outfit’s foundation in 2008. They’re also one of the bands that enjoy a loyal global following, established by Parralox’s willingness to export their brand of electropop outside of their native Melbourne. Surprisingly, this marks the first time that Parralox have performed in Liverpool. But John von Ahlen and the suavely dressed Johanna Gervin make up for their absence from a city steeped in musical history with a barrage of solid pop songs. From the outset, Parralox delivers a confident selection of tunes picked from their extensive history. This includes the rhythmic delights of ‘Black Jeans’ and the smooth synthpop of ‘Hotter’. The duo slip into cover territory for an inspired take on ‘Bring On The Dancing Horses’. Synthpop bands covering Echo & The Bunnymen might seem like a strange fit, but the electronic adaptation lends the original composition an oddly engaging appeal. It’s also a perfect demonstration that von Ahlen’s talents are just as adept on the mic as well as on synths. The buzzy ‘Wildlife’ comes across with a punch while ‘Crying On The Dancefloor’ (a song originally put forward to Andy Bell for consideration) is pure dancepop perfection. Later in the set, the duo pull out a surprisingly robust cover of Radiohead classic ‘Creep’ before delivering one of Parralox’s classics in the shape of ‘Sharper Than A Knife’. Here, the live version is delivered in a bass-heavy rendition and Gervin’s powerful vocals gives the song a particularly emotional Impact. With the video playing in the background, Johanna can’t help but quip about John’s face at the video’s end (prompting the pair to do a brief re-enactment of stabbing Parralox’s founder in the back!). The performance takes a pause while John is puzzled by what appears to be water on the stage. It takes a moment to realise that by wearing his heavy coat to perform (a nod to early Parralox live outings) he’s been sweating like a trooper. It’s time to take the coat off, revealing a Depeche Mode T-shirt – the perfect time for Parralox to launch into their take of ‘Enjoy The Silence’. Originally a charming folk song that utilised 3 recorders (and an ocarina) by the obscure Basildon outfit, here the song is given a particularly muscular outing for a solid slice of electropop goodness. There’s really only one way to close out the set and that’s with a specially adapted version of ‘Together In Electric Dreams’, which Parralox are keen to get the crowd to sing along with care of lyrics on the screen. The impromptu karaoke version culminates in a chorus, which spells out “Together in Silicon Dreams” – a fine tribute to a fine musical event. The 2017 incarnation of Silicon Dreams serves not only as an evening of entertainment, but also as an example of the importance of grassroots electronic music events. By showcasing both up-and-coming talents alongside more established acts, it’s an event which demonstrates a legacy in action. Music is an ever-evolving medium – which is as true for electronic music as it is for other genres. Silicon Dreams is a good showcase for witnessing that evolution in progress.